You’re going to look like you want to be in Brideshead Revisited if you don’t bring your own flavour to the preppy style. I found this incredible leather Nike x Parra varsity bomber in a ‘charity’ shop – except it had tags on and everything and it went for £100, nearly 5x less than it’s listed on eBay! I also scored these Gucci Chelsea boots for £180, which believe it or not was the full retail price. Preppy doesn’t always mean expensive, it usually involves good quality, timeless pieces. Haute tip: Keep accessories simple and to a minimum. 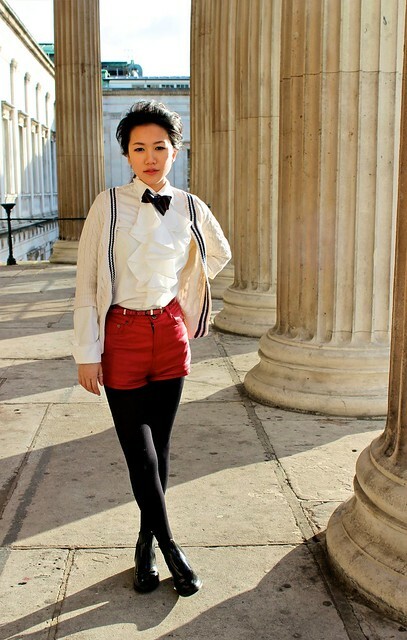 The preppy look is constantly associated with pearl stud earrings but it doesn’t need to be so boring. 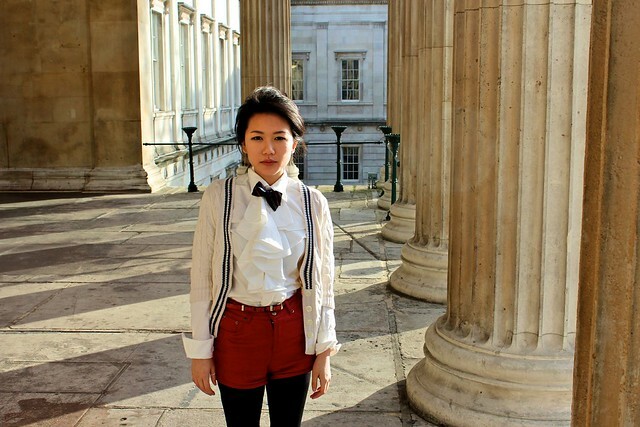 Here I’ve gone for a simple bow tie and left the entire look to speak for itself because layering is everything. Yup, it’s not just for the street style fashionistas. Go for a one-colour look with a contrast piece or trimming and there’s no going wrong. Haute tip: Textures are key here, I went for lace, cable knit and tweed. A lot of the time, people think doing preppy means polo shirts and Oxfords (just, no) – if you can truly pull of this style, you’ll be unafraid to experiment and sometimes get it wrong. Just avoid bright colours or anything that looks like it would’ve been in the costume wardrobe of White Chicks. So as long as you don’t have an A1 print of her in your bedroom, you can safely admit to loving Audrey Hepburn without being accused of being basic. Taking cues from that classic LBD and oversized glasses from Breakfast At Tiffany’s, a great evening look is a simple dress with some serious statement pieces because the party don’t start ’til you walk in . Haute tip: Yes, I did die a little writing that last sentence but also, I’m hoping that in a year or two I might find it funny. My tip for a preppy evening look is to keep hair and makeup simple and elbow length gloves may be too bold for you but I’m also unafraid of spiders so, whatever. Your boyfriend clearly has exquisite taste. MMMM I love the ruffles! love this look and i'm dying over that varsity jacket!!! In your last outfit you look like you have stepped out of a scene from the early days of gossip girl. This outfit has Blair Waldolf written all over it. Adorable! oh Andrea you look sooo cute!!! Love the prep style but with your personal touch! the photos are amazing!! thank you for finding me! i really love your photos! Great photos, your outfit is amazing! that jacket is quite amazing and unique! Love the photos and your outfits! The red shorts especially are really cute! I just love that first photograph, wonderfully composed with light and shadow. And you look terrific in the collegiate style, punctuated by Gucci (I love it when they use the iconic green and red stripes). Love the sweater, so chic! gorgeous photos! 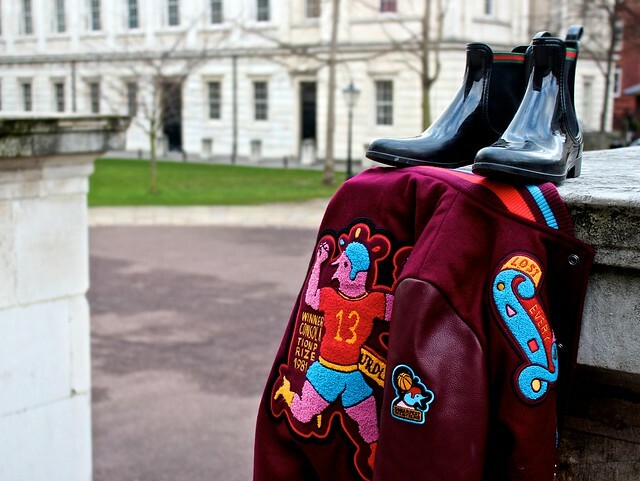 love the varsity jacket. Thanks for your wonderful comment! My friend really is an amazing photgrapher! Ooooo….bf has great taste:P Love the boots! I adore this look! 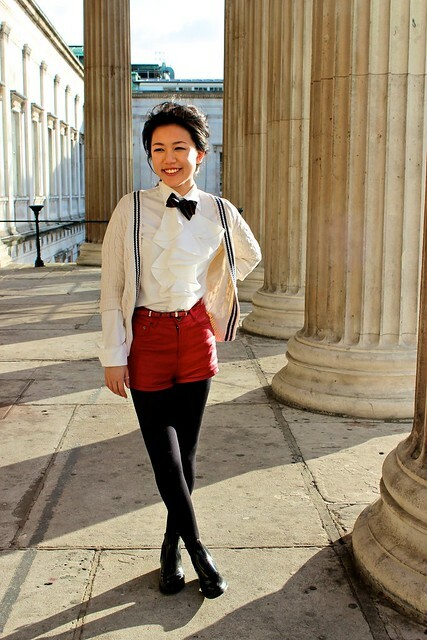 Love the take on the tuxedo look but doing it with shorts! Also love the jacket! I love your outfit! Total glam and total prep! The best of both worlds! Looks so great! Wonderful combination! LOVE the turquoise dress, Stunning !! This is such an awesome look! Just perfect. What a great blog you have! And these photos are unbelievable great!